Research Interests: I am an observational astronomer. I am primarily interested in discovering what is out there, and so I am interested in surveys, particularly for high-redshift quasars, and cool brown dwarfs. I am also interested in (strong) gravitational lensing, and quasar absorption lines. Brief bio: I have been at Imperial since 1994. My first degree was in Engineering and I worked as a Civil Engineer for 6 yrs, specialising in Geotechnics. 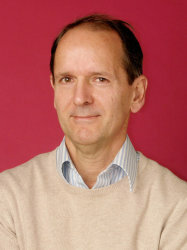 I did my PhD at the Institute of Astronomy, Cambridge, supervised by Paul Hewett, finishing in 1988, and then held a number of post-doc positions before moving to Imperial: a NATO Fellowship at Steward Observatory, Tucson, an ESO Fellowship at ESO Headquarters, Munich, and a Royal Society University Research Fellowship at Oxford. I was the Survey Scientist for the UKIRT Infrared Deep Sky Survey which finished in 2012. I was Head of Astrophysics at Imperial from 2010 to 2015. Astronomers like the Astrophysics Data System, so I have provided a link to my publications on ADS.